I am re-posting this fabulous recipe for all of you who are living in the Northern Hemisphere and are surrounded by lots of wonderful fresh produce and in particular tomatoes. This relish is easy to make, can be easily stored and goes well with a number of dishes as mentioned in my Cook’s Tips. You may have a favourite dish of your own that you would like to try it with. This relish goes wonderfully well with home made sausage rolls, cold meats, in sandwiches, a few breakfast dishes such as corn fritters, frittata, bacon & eggs. Place the tomatoes in a bowl and cover with boiling water. Leave for approximately 5-10minutes or just until the skin peels off easily. 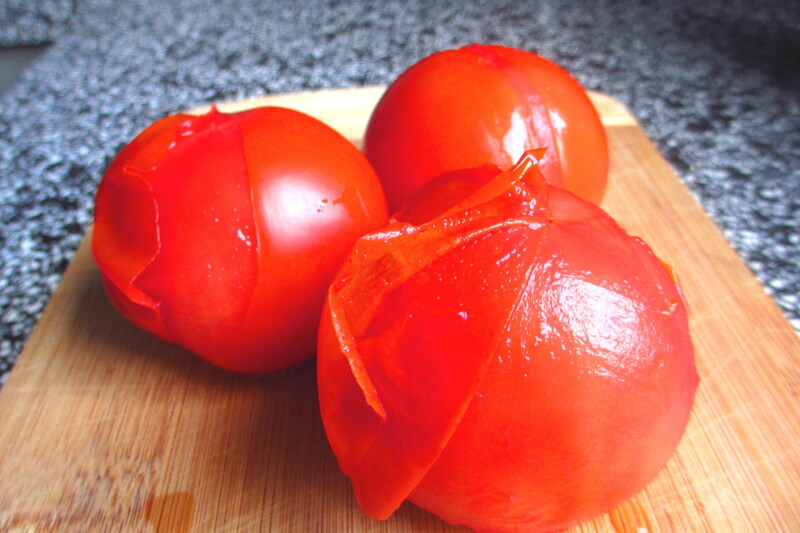 Once you have peeled all the tomatoes, chop them into small pieces. Peel and chop the onions. Heat the olive oil in the pan and add the onions. Allow the onions to soften on a medium heat stirring occasionally, this will take approximately 5-7 minutes. When the onions become slightly golden in colour add the tomato paste and cook for a couple of more minutes. Add all the tomatoes to the pan and cook for 5 minutes allowing them to soften a little. Add the Star Anise and Cinnamon Stick. Place a lid on the pan and allow to simmer gently on a low heat stirring occasionally for approximately 40 minutes. Add the sugar and cook for a further 10 minutes stirring occasionally. If there is a little bit of liquid in the pan, remove the lid and turn the heat up a little to reduce. Do keep stirring whilst the heat is up. This avoids the relish sticking to the pan. Turn the heat off. Remove the Cinnamon stick and the Star Anise and discard. Allow the relish to cool, place in a container and refrigerate. If you are not using the relish immediately, place the relish in a clean jar whilst it is still hot and seal tight. Allow it to cool down and then place in the fridge. It will last in the fridge for a couple of weeks. When serving the relish ensure that it is always at room temperature. Reblogged this on Milanka's Fine Food.